When I joined the BLDSA, it was the Ullswater Swim that grabbed my attention round the scruff of the neck and I was desperate to have a crack at swimming its 3 beautiful reaches. 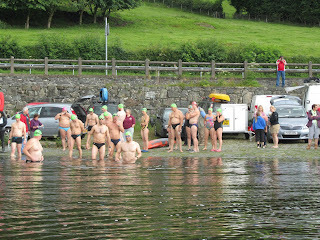 Trouble was the swim filled up quickly in 2011 and I couldn't get in. Therefore made sure in 2012 my name was the first one on the list. The 3 reaches are different and interesting in their own right. 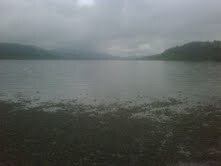 The first one at the Glenridding end of the lake is cold as it is fed from the mountains of Helvellyn and High Street. This 1-mile reach is filled with 5-ish islands and bays with crags which drop down into the clear water which looks intensely inviting. The second reach is ca. 3 miles long and more remote on the right bank and is filled with little bays which seem untouched for centuries. After Howtown, one enters the final 3-mile reach which is more populated with sailing the order of the day and much more accessible to the day trippers from Penrith etc. This reach is also more exposed to the elements and when we saw the lake for the first time on Saturday morning with my canoeist (and uncle) John, we remarked that whitecaps were countless and this was going to be a battle for the Canadian canoe that I had just bought and just to get to the end of this reach in one piece with the kayaker not capsizing would be a battle in itself. 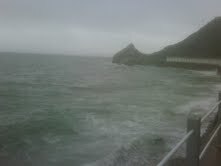 And so, it was with an element of uncertainty that we checked in for the swim on Sunday. We had practised paddling the Canadian canoe on the Saturday afternoon and even turned it upside down - thank god I had riveted in some buoyancy tanks otherwise recovery would have been a right old battle. After turning the boat turtle in the middle of the first reach we managed to swim it to the waters edge and get the water out!!! At 8.30am, I was set off with the 2 other 'leisurely swimmers' as we had put slower 1-mile times on our entry forms than most of the other 'elite' punters. We rounded the corner into the last reach and passed some cute boathouses and could see multiple yachts in the distance screaming around effortlessly in the strong winds that were capable of making any of them capsize. We plodded on until I asked for a gel to keep me going but it was so choppy my canoeist felt uncomfortable even to pass that over so I said don't worry, I'll just swim to the end and that's what we did. I was expecting the elites to catch us but they didn't....the joy of small victories!! After a while the rest of the swimmers finished in various shapes and sizes. There were 2 retirements. The lady who set off with me at 8.30am finished in under 5 hours which was immensely impressive given this was her longest swim since Conniston the year before and she had travelled up with her husband who rowed for her and he had only recently had a tripple heart bypass. To conclude, if you like Open Water swimming, this swim is the most picturesque swim in Britain by a country mile.......Also, as an aside, met some incredible people again. Shook the hand of a remarkable man who saved a girl's life recently. Also met a very brave woman who challenged herself to the limit (in her 60s?) to swim these 7 miles accompanied by her husband rowin' after a tripple heart bypass....You never meet a dull open water swimmer or their crew for that matter!!!! Got back from Bala and one thing keeps striking me. It doesn’t matter how long these BLDSA swims are but the feeling of achievement doesn’t diminish as they are all tricky in their own right………. Was feeling slightly nervous ahead of the Bala ‘training’ weekend. My longest mileage weekend in fresh water with the absence of buoyancy from salt water (had a 6 hour Gozo and 9-mile champion of champions under belt but both in salt water). 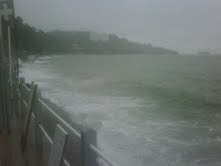 Went across the border into Wales on the Friday afternoon and it started to lash it down. Nice return to Wales I thought. Had a coffee in the hotel with my canoeist for the weekend – an English guy who lives locally called Darren who runs trips to Nepal via his company (http://www.purelandexpeditions.com). A very useful extreme canoeist whose skills would not really be severely tested during the weekend – but it saved me havingthe hassle of dragging a mate up from Kent to accompany me…. (will be a great contact going forward). His parting shot after imparting advice on the local chippie was to warn me not to step into pubs at the eastern end of town as they often housed more of therascal element of the local population (I was to hear from them later). 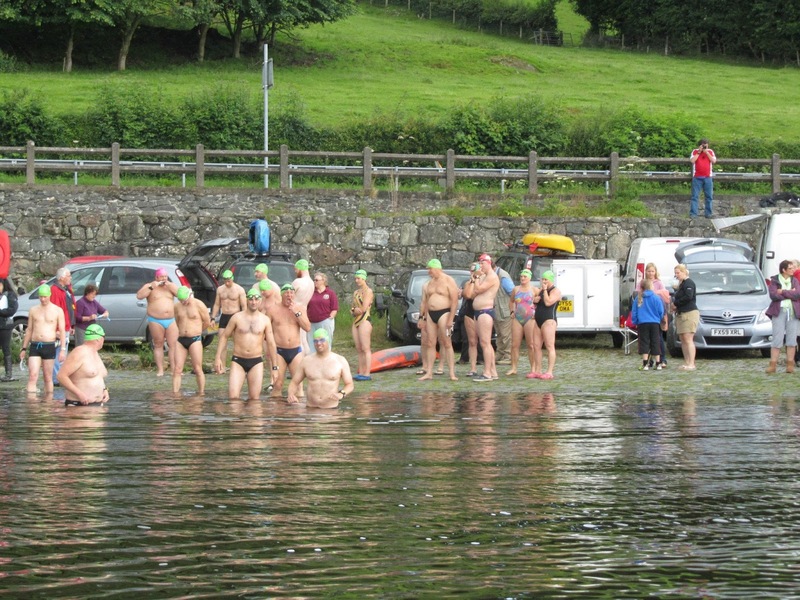 I then drove round the lake and went for a magical pre-supper swim at Langower where there is a stone jetty & where the Bala railway pulls into a small station (This, funnily enough was to be the start of the race on Sunday). All very quaint. A few ofthe locals stopping to watch a lunatic go for an evening swim – the fisherman at the end of the stone jetty admitted to ‘swimming a width of the lake once but watch out as it is cold’. After an early night, was awoken at 1am on Saturday by the local ‘yoof’having a right old go at each other in the car park out of the back of the hotel shouting aggravation at each other in Welsh. A charming interlude to the night’s sleep from some lunatics with way too much time on their hands and sweet f.a. to do. After watching the 3k loop race finish we led into the water which seemed reasonably pleasant at what the officials said was 14 degrees. In fact, it felt warmer to me as it had done the night before. 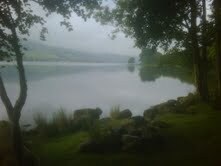 The mission was to swim 3 miles to the other end ofthe lake, turn round the boat at the end and then swim the 3 miles back. I was warned by Janet Wilson (the organiser for Loch Lomond) in no uncertain terms that if I quit during this 6-miler then my entry form for Lomond would duly be used for confetti..that fairly galvanised the mind! Set off quickly to try and set the tone for the race. The first 2-ish miles went without incident and after pulling in line with the sailing club was beginning to wonder how much furtherwe had to go but the turning boat was nowhere in sight so the final mile before the turn seemed like a slog (we all felt the same way!). The boat turned, banana dispatched and decided to kick harder to lose a few of the punters who were on my tail. There mustbe more of a current at this top end helping as I felt like I was shifting much faster compared with the slog in the previous mile to the turn and with it my mental state was more euphoric. Continued to make decent headway until the last mile when could seethe end of the lake that felt like it was never ever coming closer. It must have done as got there in ca. 3.5 hours which was in the parish of 40 mins off my personal best. What a difference a year and 5 more swim lessons has made. I concurred with Liane,the BLDSA President, that this is not an easy swim and the last mile is really tough. My kayaker (who had a race radio) reckoned that a quarter of the field retired (in fact I think it was 3 out of the 25). We all stood on the side to clap in Chris Evans who finished ca. 10 mins before the cut off time and his longest swim in his swim career – a remarkable personal achievement. He looked pale and cold and that swim to the end must have taken a fair amount of determination. He was still shaking when he picked up his certificate.Very gutsy performance. Took it steadier than the day before and struggled to find rhythm as the shoulders were mighty stiff. Made steady progress and looked to the shore and kept it in mind to just take it tree-by-tree, bury head into water to breathe and not get ahead of myself. It was way choppier than the day before and this now reminded me of my time between mile 2 and 5 on Windermere where the waves were picking up my feet and drilling my head into the water which was making it hard to get any breath (let alone rhythm). I said jokingly to my Kayaker that I thought I was going to drown – the one saving grace was being able to drink oodles of Lake water as I went along which is a refreshing change from the ghastly water in Dover harbour.…. Daz, my canoeist, saved me some time again on the swim by going headland to headland where some of the punters seemed to go down the middle (despite race organiser’s (Andy Wright) multiple recommendations). We touched the timing mat after ca. 1.5 hours. Chuffed to bits and 15 mins off my PB! This was wind assisted so won’t qualify on Olympic rules…. The buzz of achievement stayed with me all the way (5.5 hours) back to sunny Sevenoaks. Another part of the world discovered that is really truly beautiful – as long as it isn’t heaving it down – and water that is much warmer than one would have thought for Snowdonia. There were some really majestic and tranquil moments during the weekend as whitnessed before really early on the Saturday morning...... 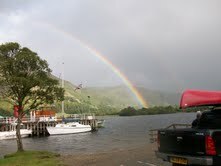 Within 2 weeks, Ullswater, and arguably England’s most beautiful swim on the cards. So, Superman (Mark Bayliss) and I decided the best plan of attack for the Torbay swim, and in order to not to use up any holiday, would be to hit the roads after work (7ish) and mosey on down to the English Riviera, pitch a tent somewhere and then report for swimming duty at the Meadfoot beach at 7.30am for the 8 mile swim. Like any good plan, we found out that flexibility was going to be key! I packed the monster truck with tuck box with food, stoves, tent, cool box with goodies and scooped up Superman at 7.30pm. We duly avoided all the tailbacks on the M25 and wormed our way past Guildford whereupon the heavens opened. I said jokingly, I bet it rains now until we get home….Wish I had been wrong…… We rocked into Torquay at around 11.30pm with some pretty heavy rain continuing and pulled up by Meedfoot Beach where the sea was coming all the way up to the harbour wall and it was going to be apparent that no tent would get pitched on the beach…. What were we thinking?! Suddenly realised I couldn’t get out of the truck as a local taxi driver pulled up so close alongside preventing me from getting out – he and I both wound windows down and he noted ‘I put money on it that you’ve been drinking’ – I retorted ‘I wish I had – just driven down from London and have been up since 5am this morning’. He wasn’t budging – ‘don’t worry I have called the police and given them your number plate’!!! Utter nonsense…. Being too tired to really give this rascal a piece of my mind I just said ‘Bring it on. Just Bring it on’’. He then drove off….What a charming welcome to Torquay. To cut a long story short, we nudged up the road and found a small park with a large tree 200 yards off the road. Exhausted, pitched the tent, pumped up my airbed and launched ourselves into the tent with the rain hammering down. We reported to the Meadfoot beach at 7.30am for registration with the waves crashing into the harbour wall and going 20m vertically up in the air. It was around that time that Superman and I realised we had actually pitched the tent on the most exposed headland in the area with no shelter from the onslaught of wind and rain. Amazing what daylight uncovers... It was impossible to walk along the pavement without a right old soaking. Swimmers, Kayakers, Safety people and the BLDSA swim organisers then started arriving and gradual decisions made upon the course of action. The 8-miler across to Brixham and back was cancelled as you couldn’t see Brixham so a ½ mile loop course laid out into the bay with 8 laps resulting in 4 miles round the bay starting at 12.15. Just when desperation was staring me in the eyes, a canoeist decided to accompany me all the way around and kept pretty close to my side. ‘Ian’ (his name I was to find out later) really helped me to hang in there – owe him big time... In the end, I settled down and after half way was in some reasonably high spirits and had convinced myself that I was absolutely flying – the water felt marginally calmer. In fact, my overall pace wasn’t too shabby as Superman and Simon Lee only caught up with me as I was finishing my 7th lap. There were times that I really wished I had been sick because I thought it might help but body wasn’t obliging. 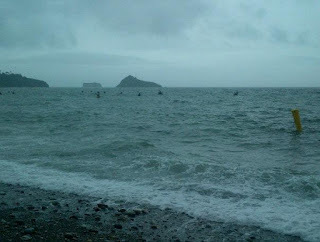 When I finished the swim, something really remarkable happened. Trying to get back to the beach was utterly mental having to avoid getting smashed into the large rocks by the large waves. The great Vince Classen held out his strong hand and scooped me out of the water whilst wearing his drysuit. Amazing and without him I certainly have been injured in some way… The other thing that was touching, and a first for me at a BLDSA swim, - not only did all the people on the beach clap, when I rose the stairs to the undercover area – both finishers and crowd clapped again. I think everyone was well aware how utterly brutal that swim was.